"We gained efficiencies in the field by 15% ...customer satisfaction is increasing." GoFormz is a certified partner of ServiceMax. Inspecta was already using ServiceMax’s solution so they easily extended the fully integrated end-to-end system with GoFormz. They now use GoFormz to complete their digital inspections forms and more. With over 1,600 professionals delivering various field services and certifications every day, the volume of daily digital inspection forms that Inspecta generates is immense. Perttu sought to address the data collection and processing challenges that this results in. How information was being gathered daily on the hundreds of paper forms was error-prone and manually intensive. Images and attachments were commonly stored separately from corresponding documents, and all the information was physically located across many places – laptops, shared drives, and mobile devices. The hand-off process between multiple field inspectors introduced headaches when it came to tracking revisions and form updates. Inspecta’s processes relied on many disparate systems which created confusion and there was a clear need to centralize the unstructured field data that was collected through the forms. Perttu quickly saw the need to address these problems and make the overall system and processes more efficient. His goal was to find a more centralized method of collecting the form data and syncing it to their ServiceMax account. Additionally, it was important that the forms would be accessible to everyone, regardless of the location, to review. Since Inspecta was already a ServiceMax customer (and pleased with the ServiceMax solutions), Perttu started by asking them for a recommendation. ServiceMax referred GoFormz, a certified alliance partner that was fully integrated with them. With the GoFormz-ServiceMax solution, Perttu immediately saw great results. Field information is collected on digital inspection forms and others, then the data is synced with ServiceMax. “We gained efficiencies in the field by 15% because we can now deliver documents right away to our customers. Which led to our customer satisfaction increasing” says Perttu. With the GoFormz and ServiceMax integration, the inspectors can generate a Template object connected to a Work Order in ServiceMax. When the Template object is saved, a form in GoFormz is created with corresponding fields pre-populated with data from ServiceMax. Inspectors finish filling out the mobile form and upon completion the form is synced back to the Integration Server. Next, this creates a NDT Report object (linked to the Work Order) with the data from the form and an attached PDF of the form to the Work Order record in ServiceMax. Inspecta’s customer billing also saw an increase in efficiencies. The office receives field data from the jobsite in near real-time, allowing the administrative team to send an invoice to the customer immediately. With GoFormz and ServiceMax integrated, the information captured in the mobile forms is automatically routed into Inspecta’s ServiceMax account as soon as the form is completed. This provides real time data for the company to review, available across many departments. Since implementing GoFormz, Inspecta has seen increases in customer satisfaction, efficiency of field workers by 15% and improvements in the quality of documentation. They are now rolling GoFormz out across multiple countries and locations because of these initial successes. Higher customer satisfaction. 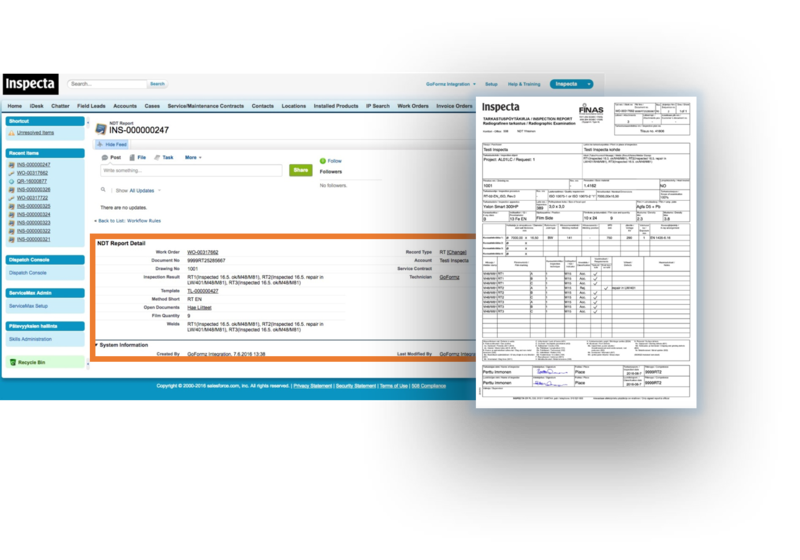 Real-time, actionable data enables on-site customer document delivery, resulting in faster billing. Dynamic logic helps users capture critical field data. Increased efficiency of field workers by 15%. This results in back-office reporting time that can now be used to deliver more field inspections.